Do you want to learn the Lao language, Lao history, and Lao culture? What better way to do it than to spend your summer fully immersed in Lao society in Laos! The Center for Lao Studies (CLS), dedicated to promoting and advancing the field of Lao Studies, is sponsoring its annual Summer Study Abroad in Laos program (SAIL) in the Summer of 2018. During the five week‐long program, students will partake in language and cultural lessons at the Lao‐American College (LAC), with private instruction by professors from the National University of Laos. Participants will also have the opportunity to study Lao history and culture, augment their academics with cultural trips throughout the area, and experience volunteering with various organizations. Laos, once known as Lan Xang or Land of a Million Elephants, has had both a prosperous and turbulent past. A thriving royal history for many centuries, the kingdom became a part of French Indochina in the late 1800s. In the 1960s and early 1970s, civil war broke out between the Royal government and the Pathet Lao, which led to U.S. intervention and an unprecedented bombing campaign by the American CIA as part of its “Secret War.” Today Laos is finally experiencing peace and stability, and is focusing on its economic and social development. Geographically, Laos is the only landlocked country in Southeast Asia and is bordered by China, Myanmar (Burma), Thailand, Cambodia and Vietnam. Laos boasts a varied landscape with primary tropical rain-forests, abundant rice fields, rare wildlife and one of the most ethnically diverse populations in Southeast Asia. The country has increasingly become a popular tourist destination for its rugged beauty, rich culture, and some of the friendliest, most welcoming people in Asia. Throughout the program, SAIL participants will be introduced to the unique characteristics of the country itself, its growing role in the global arena, and the history that has made it what it is today. 3). To promote dialogue and collaboration between participants and Lao scholars, artists, teachers, students, and others in an effort to raise public awareness on a broad range of issues related to Laos. SAIL students will be participating in a Lao language program tailored specifically to the group’s needs at one of the country’s most acclaimed, and popular, language institutions – the Lao‐American College (http://www.lac.edu.la). Located in Vientiane, Lao‐American College offers a unique instructional and service program and is the cornerstone of our program. Intensive courses combined with individual language tutorials, diversified field trips, access to local University students, modern facilities, and an experienced on‐site staff, make Lao‐ American College an incredible place to study Lao and learn cross‐ cultural skills. SAIL participants spend three to four hours a day in classroom training and can pair up with Lao students to further improve their speaking and listening comprehension. 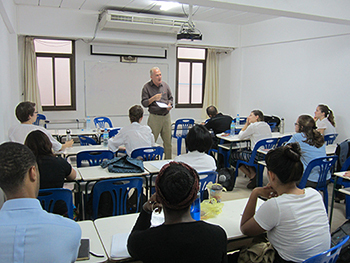 Classroom time is split between language lessons and a newly updated, comprehensive Lao History and Culture course taught by foreign and local experts. SAIL students who have successfully completed their Lao language, history and culture courses may be able to earn up to 10 academic credits. For satisfactory participation in the program, participants will receive 10 semester hours of undergraduate credit in the following Northern Illinois University (NIU) courses: Language Course (5 semester hours) based on the language placement test, SAIL students are enrolled in either INTL101- Beginning; INTL 201 - Intermediate; or INTL 301 - Advanced/Heritage and IDSP 301 - Study Abroad Programs (5 semester hours). The Lao-American College will issue a transcript to students; and SAIL will offer the student a certificate upon program completion. Students who desire to obtain college credit through NIU as a "special student" will need to pay an additional $1,035 fee to CLS plus $200 application/deposit fee to NIU (these are not included in SAIL's program fee) for credit transfers. Credit transfers from NIU are subject to prior approval from the student’s home institution. Please check with your advisor, professors, and the study abroad program department at your college or university first. Students could apply for financial aid through their home institution. Please check with the financial aid office. Follow the link below for more detailed instructions on how students can sign up for credit through NIU at http://niu.studioabroad.com/?go=SAIL. ​Lao Language Class: Language classes are held five times a week for 3 hours. Classroom trainings are taught by top language professors from the National University of Laos and include lessons in reading and writing Lao as well as speaking and listening comprehension. Based on the language placement test, SAIL students are enrolled in beginning, intermediate, or advanced (heritage) class. A heritage class is designated for Lao Americans and those who already know how to speak Lao. Aside from classroom trainings, students may also request private, supplementary lessons with language professors. Language Partner: Efforts are made to match SAIL participants with Lao partners who can assist them in language acquisition and to gain deeper insight into the culture. Partnerships are informally arranged with LAC students (although participants are free to partner with whomever they choose) with partners having the flexibility to determine their own meeting schedules. Having a Lao partner is a wonderful opportunity to practice conversational Lao, to help the Lao student improve their English skills, and to make new friends. Please note, SAIL staff will facilitate an introduction only between student and Lao partners, however, on-going meetings between partners will be the responsibility of the student. To augment your in‐country, practical knowledge of the country, 4 hours a week will be spent learning about Lao history and culture from academics. Lessons will focus on readings selected by experts on multiple topics, and be discussion‐based. Lao and international professors, scholars and leaders in their field will rotate teaching the class, with lessons conducted both in the classroom, and around Vientiane when appropriate. All courses will be taught in English. There will be ample opportunities for SAIL students to practice their Lao, such as speaking with young monks, vendors and shopkeepers, and with high school and college students who will be eager to speak English. These exchanges will improve speaking and listening skills and teach useful expressions! Upon your arrival in the capital, an in‐country Program Leader will familiarize you with the area, including how to take a tuk‐ tuk or Jumbo, where to find the best iced‐coffee, navigating the Talat Xao or “Morning Market” and locating services such as ATM machines and money exchangers. Tours and excursions to many of Laos’ most important places are included as part of your experience to help you gain a deeper understanding of Lao culture and history. Sample activities in and around Vientiane include: visit to the quirky and mystical Buddha park; tour of the Phra That Luang Stupa and Ho Phrakeo (Emerald Buddha temple); picnic along the Nam Ngum (River); and participation in a customary Sukhwan or Baci ceremony. Longer weekend trips include an overnight village stay where participants will learn how to make traditional handicrafts and live in traditional Lao housing. A highlight is an extended weekend trip to one of Laos’ Northwest or Southern provinces, such as a tour of the former royal capital and UNESCO World Heritage City, Luang Prabang, or to see the mysterious Plain of Jars in Xiang Khouang province. Program dates are: June 27 – July 31, 2018. All SAIL participants must partake in the phone orientation with the Program Coordinator in the beginning of June. For those who wish to stay longer than five weeks, SAIL will assist in the arrangement. SAIL is open to undergraduate and graduate students, educators, and education administrators, as well as those interested in Lao, Lao American, Southeast Asian, and Asian cultures and society. Participants must be 18 years or older. It is recommended that you discuss your participation in the Lao program with the CLS Program Coordinator prior to enrollment. SAIL is open to those not living in the U.S., but a valid passport and participation in the pre‐departure orientation phone call is mandatory. Students must also complete enrollment forms for CLS and Lao‐American College. An on‐site orientation and a Lao language placement exam will take place at the LAC upon arrival. Cost is per person for the five-week program. The price is based on a minimum of 6 students and is subject to change. CLS occasionally is able to offer scholarships to eligible participants. Interested candidates need to inquire with CLS for eligibility and submit a complete application and required forms by April 16, 2018. For those who may qualify for an outside grant to subsidize the program cost, there are a number of organizations where you can apply for the grant directly. You also might want to contact your local Lao organization or the financial aid office for support. For further information and a list of funding sources, please visit CLS webpage or contact the CLS office. We can also put you in touch with past scholarship recipients for more information on the application process. *If the student is accepted into SAIL, the application fee will apply toward the program cost. **If student wants to earn undergraduate college credit for satisfactory participation for the courses, they must pay an extra $1,035 fee. See details in "COLLEGE CREDIT" section above. Fee is not included in the SAIL program costs. SAIL students will stay in single or double‐occupancy rooms in a basic hotel or “guesthouse” ‐ accommodations convenient to the school or the center of town. Single occupancy rooms (if available) are $200 extra per month. Laundry service is usually not included, but laundry needs can be facilitated by your Program Leader. There will likely be Internet access at your guesthouse, but please check back with us to confirm. Internet and wireless access is available at the LAC or at many sites in the capital. All SAIL participants must hold a health insurance policy that covers overseas travels. You may use your existing health insurance policy if it covers overseas incidents. A proof of overseas insurance coverage must be submitted to CLS prior to departure. CLS can also provide information on obtaining more extensive insurance. U.S. citizens are required to show a valid passport (with at least 6 months until expiration) and visa for entry into Laos. SAIL participants are responsible for obtaining their own Lao visa, which can be purchased upon arrival in the country for $35. Those wishing to obtain a one‐month visa beforehand, can do so through the Lao embassy in Washington D.C. for $50. Please contact CLS directly if you would like to consider this option. If you are a Lao American, a two‐month visa is usually granted by the Lao immigration upon arrival. CLS will send you a packet of instructions upon your acceptance. Non‐U.S. citizens should contact their local Consulate regarding visa and entry requirements. In Summer 2018, SAIL participants will work with an in-country Program Leader with extensive knowledge of Laos, the Lao language and Lao culture. The Program Leader will be your guide, trip coordinator, and resource for understanding the many aspects of the people and the country. Most importantly, your leader will assist you in accessing those activities and personal experiences that are most meaningful to you.